The purpose of the Operations KPIs by Engineer report is to help you communicate key goals to your engineering team and provide them with feedback on how they are progressing against those goals. In the “heat of battle” as an MSP, it is easy to get distracted as an engineer. So you may not be managing your schedule as well as you should. Or not recording your billable time, even though you are working hard. Or not submitting your timesheets in a timely fashion. This information is available as a standard report, a dashboard, and a smartphone report. Count Tickets with Past Due Schedule Entries – Number of tickets for each engineer that have time scheduled on their calendar that SHOULD have been worked in the past, but have not been addressed. Tickets Scheduled Today/Tomorrow/Next 7 Days – Number of tickets scheduled to be worked by this engineer in each of the timeframe categories. Hours Scheduled Today/Tomorrow/Next 7 Days – Number of hours scheduled to be worked by this engineer in each of the timeframe categories. Count Tickets Scheduled with No Date – Number of tickets for each engineer that have time scheduled to be addressed at some point in the future, but no specific date has been assigned to that task. Surveys – Average survey points on tickets worked by this engineer in each timeframe category. Efficiency Utilization 7 days/30/60/90/YTD – Percentage of “Daily Capacity” hours which is billable. For example: If an engineer reported 30 billable hours in a week and has a daily capacity of 8 hours per day, then the “efficiency utilization” would be 75% even if that engineer reported a 60 TOTAL hours for that week. (i.e. utilization is percentage of normal number of hours for this engineer). Hours Scheduled – Number of hours scheduled for this engineer. Hours Open – Number of hours available to be schedule for this engineer based on daily capacity. Open Project Tickets – How many projects are open for this engineer? Project Tickets – No Next Action – How many open project tickets does this engineer have that do NOT have something scheduled in the future? 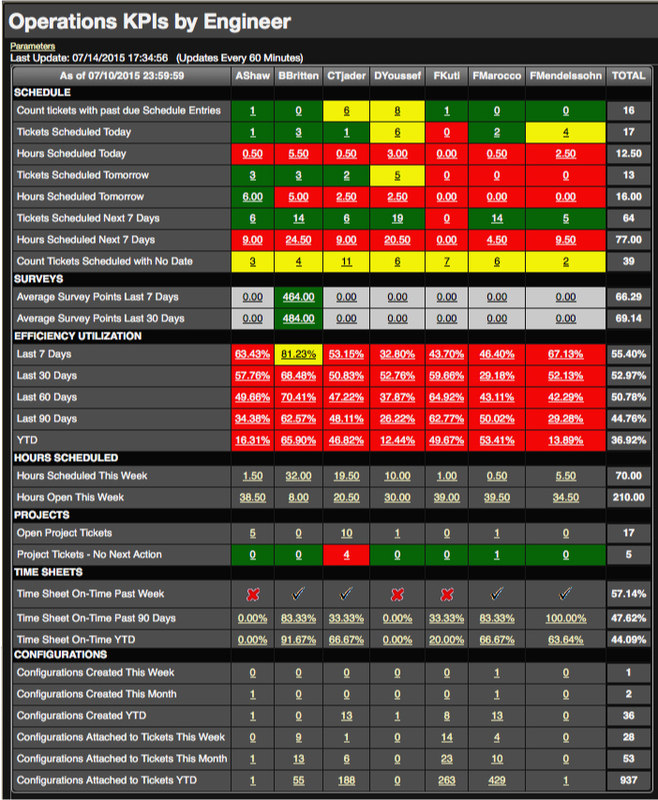 TimeSheets – For multiple timeframes, what percentage of this engineers timesheets have been submitted for review in a timely fashion? Configurations Created – For multiple timeframes, how many new configurations has this engineer created? Configurations Attached- For multiple timeframes, how many configurations has this engineer attached to tickets to denote the device being worked on in this ticket?